Beautifully engraved certificate from the New York Central and Hudson River Railroad issued in 1898. 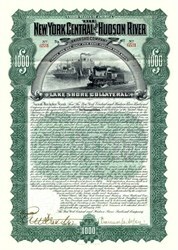 This historic document was printed by the American Banknote Company and has an ornate border around it with a beautiful vignette of a train passing by the harbor with an old sailing vessel in the background. This item has the signatures of the Company�s officers, and is over 114 years old. THE NEW YORK CENTRAL AND HUDSON RIVER RAILROAD COMPANY. 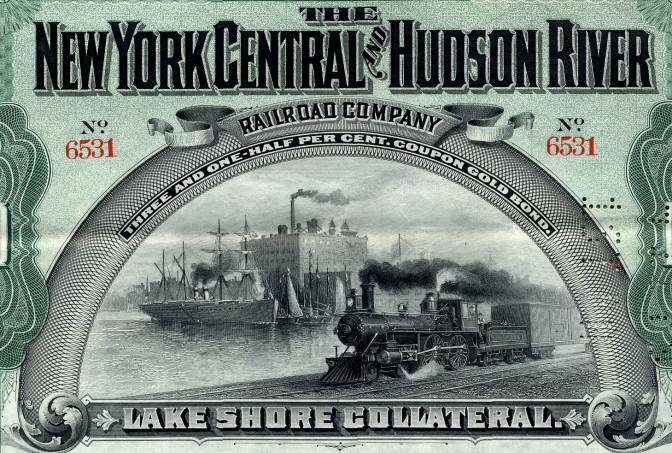 The New York Central and Hudson River Railroad Company, organized November 1, 1869. Rome Watertown and Ogdensburg Railroad Company, organized April 20, 1885. The Utica and Black River Railroad Company, incorporated May 22, 1861. Oswego and Rome Railroad Company, incorporated April 11, 1863. The Niagara Falls Branch Railroad Company, incorporated December 24, 1875. Carthage Watertown and Sackets Harbor Railroad Company, incorporated February 5, 1869. Little Falls and Dolgevlle Railroad Company, incorporated December 27, 1902. Cornwall Bridge Company, incorporated July 28, 1897. The Hudson River Bridge Company at Albany, incorporated April 9, 1856. New York and Fort Lee Railroad Company, incorporated March 14, 1861, as The New York and Bull's Ferry Railroad Company. New York and Ottawa Bridge Company, incorporated April 17, 1899. Ottawa and New York Railway Company, chartered 1882 as the Ontario Pacific Railway Company. The St. Lawrence & Adirondack Railway Company, incorporated July 2, 1896. Beech Creek Railroad Company, incorporated May 11, 1898; leased from October 1, 1890. Beech Creek Extension Railroad Company, organized April 1, 1905; leased from June 1, 1905. Boston and Albany Railroad Company, incorporated September 4, 1867; leased from July 1, 1900. Chester and Becket Railroad Company, incorporated July 24, 1896; under lease of Boston and Albany Railroad. The Dunkirk Allegheny Valley and Pittsburgh Railroad Company, incorporated December 31, 1872; leased from December 1, 1872. Geneva Corning and Southern Railroad Company, organized February 4, 1909; leased from April 1, 1909. Jersey City and Bayonne Railroad Company, incorporated March 2, 1886; under lease of New Jersey Junction Railroad. New Jersey Junction Railroad Company, incorporated February 27, 1886; leased from July 1, 1886. New Jersey Shore Line Railroad Company, chartered March 2, 1886; capital stock owned by New Jersey Junction Railroad Company. New York and Harlem Railroad Company, incorporated April 25, 1831; leased from April 1, 1873. North Brookfield Railroad Company, incorporated June 24, 1875; under lease of Boston and Albany Railroad. Pittsfield and North Adams Railroad Corporation, incorporated March 18, 1845; under lease of Boston and Albany Railroad. Providence Webster and Springfield Railroad Company, incorporated March 23, 1882; under lease of Boston and Albany Railroad. State Line and Stony Point Railroad Company, incorporated March 6, 1886; capital stock owned by New Jersey Junction Railroad Company. Troy and Greenbush Railroad Association, incorporated May 14, 1845; leased to The Hudson River Railroad Company, June 1, 1851. The Wallkill Valley Railroad Company, organized July 2, 1877; leased from May 1, 1899. Ware River Railroad Company, organized June 12, 1873; under lease of Boston and Albany Railroad. West Shore Railroad Company, organized December 5, 1885; leased from January 1, 1886. Dolgeville and Salisbury Railway Company, incorporated July 8, 1907; agreement dated July 24, 1906. The Terminal Railway of Buffalo, incorporated June 12, 1895; agreement dated January 1, 1899. The St. Lawrence & Adirondack Railway Company, incorporated July 2, 1896; agreement dated June 1, 1898. THE NEW YORK CENTRAL AND HUDSON RIVER RAILROAD COMPANY, organized November 1, 1869, composed of The Hudson River Railroad Company (incorporated May 12, 1846) and The New York Central Railroad Company (organization effective May 1, 1853). THE HUDSON RIVER RAILROAD COMPANY was incorporated May 12, 1846, to build and operate a railroad from New York city to East Albany. The road was opened for traffic in sections as completed, the entire length being put into operation by October 3, 1851. THE NEW YORK CENTRAL RAILROAD COMPANY was a consolidation, becoming effective May 1, 1853, of various companies having railroads between Albany and Troy and Buffalo and was organized under a special law of the State of New York, passed April 2, 1853; agreement of consolidation dated May 17, 1853, and filed in office of the Secretary of State of the State of New York, July 7, 1853. The Albany and Schenectady Railroad Company, incorporated April 17, 1826, as the Mohawk and Hudson Railroad Company. The Buffalo and Lockport Railroad Company, incorporated April 29, 1852. Buffalo and Rochester Railroad Company, consolidated December 7, 1850. The Mohawk Valley Railroad Company, incorporated December 29, 1852. The Rochester Lockport and Niagara Falls Railroad Company, incorporated December 14, 1850. The Rochester and Syracuse Railroad Company, consolidated August 1, 1850. The Schenectady and Troy Railroad Company, incorporated May 21, 1836. The Syracuse and Utica Railroad Company, incorporated May 11, 1836. Syracuse and Utica Direct Railroad Company, incorporated January 26, 1853. The Utica and Schenectady Railroad Company, incorporated April 29, 1833. The Buffalo and Niagara Falls Railroad Company, incorporated May 3, 1834; merged April 23, 1869. The Lewiston Railroad Company, incorporated May 6, 1836; merged September 30, 1855. Rochester and Lake Ontario Railroad Company, incorporated May 17, 1852; merged September 30, 1855. The Saratoga and Hudson River Railroad Company, incorporated April 16, 1864; merged September 9, 1867. Buffalo Erie Basin Railroad Company, incorporated July 8, 1876; merged March 7, 1913. Carthage and Adirondack Railway Company, incorporated March 28, 1883; merged March 7, 1913. The Geneva and Lyons Railroad Company, incorporated October 5, 1877; merged January 20, 1890. The Gouverneur and Oswegatchie Railroad Company, incorporated April 12, 1892; merged March 7, 1913. The Junction Railroad Company, incorporated April 20, 1870; merged October 1, 1879. The Mohawk and Malone Railway Company, incorporated June 23, 1892; merged March 7, 1913. The New York Central Niagara River Railroad Company, incorporated March 26, 1877; merged March 7, 1913. New York and Ottawa Railway Company, organized January 19, 1905; merged March 7, 1913. The New York and Putnam Railroad Company, incorporated January 13, 1894; merged March 7, 1913. The Mahopac Falls Railroad Company, organized March 8, 1884; merged with The New York and Putnam Railroad Company, March 7, 1913. Niagara Bridge and Canandaigua Railroad Company, incorporated August 25, 1858; merged January 10, 1890. The Spuyten Duyvil and Port Morris Railroad Company, incorporated March 4, 1869; merged March 7, 1913. The Syracuse Junction Railroad Company, incorporated June 9, 1873; merged October 7, 1879. Tivoli Hollow Railroad Company, incorporated May 15, 1893; merged March 7, 1913. Tonawanda Island Bridge Company, incorporated April 21, 1883; merged March 7, 1913. The details of the history of the several companies mentioned in the foregoing statements are herewith given in alphabetical order. THE ALBANY AND SCHENECTADY RAILROAD COMPANY: see The New York Central Railroad Company. Incorporated April 17, 1826, as the Mohawk and Hudson Railroad Company; road opened September 24, 1831. This was the first railroad built in the State of New York. April 19, 1847, the name was changed to The Albany and Schenectady Railroad Company. Consolidated into The New York Central Railroad Company under the Act of 1853. THE ALBANY AND WEST-STOCKBRIDGE RAILROAD COMPANY: see Boston and Albany Railroad Company. ATHOL AND ENFIELD RAILROAD COMPANY: see Boston and Albany Railroad Company. THE ATTICA AND BUFFALO RAILROAD COMPANY: see The Buffalo and Rochester Railroad Company. THE AUBURN AND ROCHESTER RAILROAD COMPANY: see The Rochester and Syracuse Railroad Company. THE AUBURN AND SYRACUSE RAILROAD COMPANY: see The Rochester and Syracuse Railroad Company. Incorporated May 11, 1898, by agreement of May 6, 1898, by the merging and consolidation of the Beech Creek Railroad Company and the Cambria County Railroad Company. The Beech Creek Railroad Company had been incorporated June 30, 1886, as the successor of the Beech Creek Clearfield and Southwestern Railroad Company, incorporated March 20, 1883, by change of name from The Susquehanna and South Western Railroad Company and sold under foreclosure June 4, 1886. This latter named company was incorporated August 12, 1882, to operate a line of railroad extending from Williamsport to the southern line of Clearfield county, about one hundred miles. The Cambria County Railroad Company was incorporated August 31, 1896, and opened February 1, 1897. The railroad and property of the former Beech Creek Railroad Company, and all extensions to be afterwards acquired, were leased under date of December 15, 1890, to The New York Central and Hudson River Railroad Company, for a term of nine hundred and ninety-nine years from October 1, 1890, the lessee agreeing to pay, as rental, four per cent per annum upon the then existing capital stock of $5,000,000 and all that might subsequently be issued under the terms of the lease; four per cent interest on the then existing first mortgage bonds amounting to $5,000,000, and interest upon such additional bonds as might be issued under the terms of the lease; all taxes; and the expense of maintaining the corporate organization of the Beech Creek Railroad Company, at a cost not greater than $6,000 per annum. The capital stock was increased in 1892 to $6,000,000 and in the same year $1,000,000 second mortgage bonds, bearing interest at the rate of five per cent, were authorized and issued. BEECH CREEK CLEARFIELD AND SOUTWESTERN RAILROAD COMPANY: see Beech Creek Railroad Company. Organized April 1, 1905, by consolidation and merger of Beech Creek Extension Railroad Company, Curwensville and Bower Railroad Company, Pittsburgh and Eastern Railroad Company and The Clearfield Southern Railroad Company, with an authorized capital stock of $10,000,000 and a consolidated four per cent mortgage of $20,000,000. Under date of June 22, 1905, the new company leased all of its railroad and railroad property to The New York Central and Hudson River Railroad Company for nine hundred and ninety-nine years from June 1, 1905, the terms of the lease providing for the guarantee, by the lessee company, of the principal of the consolidated mortgage bonds, not to exceed $20,000,000, and the payment of interest at the rate of four cent per annum on such portion of them as may, from time to time, be issued in accordance with the conditions stated in the mortgage; also the payment of interest at the rate of three and one-half per cent per annum on $3,500,000 first mortgage bonds of the former Beech Creek Extension Railroad Company until such time as a like amount of the consolidated mortgage bonds of the new company shall be issued in their stead. On December 27, 1913, this company merged with itself the Hooverhurst and Southwestern Railroad Company, incorporated May 9, 1902. Beech Creek Extension Railroad Company (first organization) was incorporated March 30, 1901, by the consolidation of the Susquehanna and Clearfield Railroad Company (incorporated December 8, 1879); the West Branch Valley Railroad Company (incorporated November 7, 1898); and the Canoe Creek Railroad Company (incorporated May 22, 1900), and was leased to The New York Central and Hudson River Railroad Company from May 22, 1901; the consideration being the payment of interest at the rate of three and one-half per cent per annum on first mortgage bonds, of which $3,500,000 were issued and are still outstanding. Curwensville and Bower Railroad Company was incorporated March 31, 1903, and the road opened July 18, 1904. The New York Central and Hudson River Railroad Company operated the road under annual lease until the time of its consolidation with the Beech Creek Extension Railroad Company. Pittsburgh and Eastern Railroad Company was incorporated January 3, 1895, and the road opened November 16, 1896. This company was formed by consolidation of the Pittsburgh and Eastern Railroad Company, incorporated March 20, 1894; the Loyalhanna and Youghiogheny Railroad Company, incorporated June 18, 1894; and the Philadelphia and Pittsburgh Railroad Company, incorporated May 5, 1893. The Pittsburgh and Eastern Railroad was operated by The New York Central and Hudson River Railroad Company from December 27, 1899, to February 24, 1904, under the terms of an agreement with the Pennsylvania Railroad Company, and from the latter date to the time of its consolidation with the Beech Creek Extension Railroad Company under the terms of a lease dated February 24, 1904, the consideration being payment of interest on all outstanding obligations. The Clearfield Southern Railroad Company was incorporated July 6, 1898; opened in 1899; amended articles of association covering the extension of the road filed with the Commonwealth of Pennsylvania September 28, 1903. The New York Central and Hudson River Railroad Company operated the Clearfield Southern Railroad until the time of its consolidation with the Beech Creek Extension Railroad Company under the terms of a lease dated October 1, 1903, with privilege of renewal from year to year; the consideration being payment of interest on all outstanding obligations. BLACK RIVER AND MORRISTOWN RAILROAD COMPANY: see The Utica and Black River Railroad Company. THE BLACK RIVER AND UTICA RAILROAD COMPANY: see The Utica and Black River Railroad Company. THE BLOSSBURG AND CORNING RAILROAD COMPANY: see Geneva Corning and Southern Railroad Company. This company was formed September 4, 1867, by the consolidation of the Boston and Worcester Railroad Corporation and the Western Railroad Corporation, and on November 2, 1870, a consolidation with The Albany and West-Stockbridge Railroad Company and the Hudson and Boston Railroad Corporation was effected. Boston and Worcester Railroad Corporation. Incorporated June 23, 1831, for the purpose of constructing a line from Boston to Worcester. This line was completed and operations commenced July 3, 1835. Branches from Natick to Saxonville, and from Millbury Junction to Millbury were completed in 1846; from Riverside Junction to Newton Lower Falls, from South Framingham to Milford and from the main line to Brookline in 1847. All these branches were constructed under the original charter of the Boston and Worcester Railroad Corporation. Western Railroad Corporation. Incorporated March 15, 1833, for the purpose of building a line westward from Worcester to Springfield, and eventually to the western boundary of the State of Massachusetts. This road was completed and operations commenced October 4, 1841. The Albany and West-Stockbridge Railroad Company. Incorporated May 5, 1836, by change of name from Castleton and West Stockbridge Railroad Company (incorporated May 5, 1834, in the State of New York), for the purpose of continuing the line of the Western Railroad Corporation from the Massachusetts state line to Albany. This extension was completed December 21, 1841. Hudson and Boston Railroad Corporation. On April 26, 1832, the State of New York chartered The Hudson and Berkshire Railroad Company and made certain advances to aid the construction of its line, which was completed from Hudson to Chatham Four Corners and was opened for use in September, 1838. Owing to a default in the repayment of its advances, the State of New York sold the line November 21, 1854, and it was purchased in the interests of the Western Railroad Corporation and was then reorganized as the Hudson and Boston Railroad Corporation. Grand Junction Railroad and Depot Company. Incorporated April 24, 1847, by change of name from the Chelsea Branch Railroad Company, incorporated April 10, 1846, and its line built from the main line of the Boston and Worcester Railroad Corporation to the harbor at East Boston. It was purchased by the Boston and Worcester Railroad Corporation March 6, 1867. The Springfield and North-eastern Railroad Company. Incorporated May 6, 1878, succeeding the Springfield Athol and North-eastern Railroad Company, which was incorporated February 6, 1873 (by change of name from Athol and Enfield Railroad Company, incorporated April 17, 1869), and which constructed the line from Springfield to Athol and opened it on December 3, 1873. This road was purchased by the Boston and Albany Railroad Company July 8, 1880. Chester and Becket Railroad Company: operated under contract. North Brookfield Railroad Company: operated under lease. Pittsfield and North Adams Railroad Corporation: operated under lease. Providence Webster and Springfield Railroad Company: operated under contract. Ware River Railroad Company: operated under lease. The Boston and Albany Railroad was leased to The New York Central and Hudson River Railroad Company November 15, 1899, for a term of ninety-nine years from July 1, 1900, the consideration being the payment of interest on the funded debt of the lessor company and a guaranteed rental equivalent to eight per cent per annum upon its outstanding capital stock. The lessee company assumed all leases and contracts of the lessor company. Certain property exempted from the lease of November 1, 1899, was purchased by The New York Central and Hudson River Railroad Company, under the terms of a supplementary agreement, for the sum of $5,500,000, payable by a special three and one-half per cent one-hundred year debenture bond of that company. BOSTON AND WORCESTER RAILROAD CORPORATION: see Boston and Albany Railroad Company. BUFFALO ERIE BASIN RAILROAD COMPANY: see The New York Central and Hudson River Railroad Company. Incorporated July 8, 1876, and road opened in 1877; was operated by The New York Central and Hudson River Railroad Company by virtue of its ownership of the entire capital stock; merged March 7, 1913. BUFFALO AND BLACK ROCK RAILROAD COMPANY: see The Buffalo and Niagara Falls Railroad Company. THE BUFFALO AND LOCKPORT RAILROAD COMPANY: see The New York Central Railroad Company. This company was incorporated April 29, 1852. Construction of its road was in progress at the date of consolidation and the road was opened in 1854. Consolidated into The New York Central Railroad Company under the Act of 1853. THE BUFFALO AND NIAGARA FALLS RAILROAD COMPANY: see The New York Central Railroad Company. Incorporated May 3, 1834, by an Act passed on that date, being Chapter 269 of the Laws of the 57th Session of the Legislature of the State of New York, with power to construct a single or double track railroad between the city of Buffalo and the village at Niagara Falls and to operate same for the term of fifty years from the date of incorporation. Under the same Act the company was empowered to absorb, for a sum not to exceed $10,000, all rights, privileges and franchises belonging to the Buffalo and Black Rock Railroad Company, which had been built and was being operated by horse power. The road was completed and opened in 1845, leased to The New York Central Railroad Company December 22, 1853, and merged with that company April 23, 1869. Buffalo and Black Rock Railroad Company was incorporated April 29, 1833. An Act, passed April 8, 1834, being Chapter 91 of the Laws of 1834, authorized the company to construct a railroad over lands belonging to the State of New York between the city of Buffalo and the village of Black Rock. This company was the first one to report to the state authorities, filing its first report in the office of the Secretary of State January 7, 1835. This report is for the years 1833 and 1834 and says, "This road was commenced about November 1, 1833, and a small portion of it was completed during that year; it was fully completed and the first car passed over the entire road on May 16, 1834, since which time it has been kept in constant operation for the conveyance of passengers. Length of road: three miles and a few rods." The road was operated by horse power and no freight was carried. BUFFALO AND ROCHESTER RAILROAD COMPANY: see The New York Central Railroad Company. Consolidation, December 7, 1850, of The Attica and Buffalo Railroad Company, which was incorporated May 3, 1836, and road opened in December, 1842; and The Tonawanda Railroad Company, which was incorporated April 24, 1832, and road opened in 1837. In 1852 this company opened a direct road from Buffalo to Batavia, keeping that part of the Attica and Buffalo line between Attica and Batavia as a branch. Consolidated into The New York Central Railroad Company under the Act of 1853. CAMBRIA COUNTY RAILROAD COMPANY: see Beech Creek Railroad Company. THE CANANDAIGUA AND NIAGARA FALLS RAILROAD COMPANY: see Niagara Bridge and Canandaigua Railroad Company. CANOE CREEK RAILROAD COMPANY: see Beech Creek Extension Railroad Company. CARTHAGE AND ADIRONDACK RAILWAY COMPANY: see The New York Central and Hudson River Railroad Company. Incorporated March 28, 1883; road opened August 22, 1889, and leased to The New York Central and Hudson River Railroad Company May 1, 1893, the consideration being four per cent per annum upon mortgage bonds not exceeding $1,600,000 and the guarantee of the principal of said bonds. Merged March 7, 1913. CARTHAGE WATERTOWN AND SACKETS HARBOR RAILROAD COMPANY: see The New York Central and Hudson River Railroad Company. Incorporated February 5, 1869. Its railroad was leased to The Utica and Black River Railroad Company, February 1, 1872, for the term of its corporate existence, at a rental of thirty-seven and one-half per cent of its gross earnings. The lease was assigned to the Rome Watertown and Ogdensburg Railroad Company and assumed by The New York Central and Hudson River Railroad Company. Consolidated April 16, 1913. CASTLETON AND WEST STOCKBRIDGE RAILROAD COMPANY: see Boston and Albany Railroad Company. CHELSEA BRANCH RAILROAD COMPANY: see Boston and Albany Railroad Company. Incorporated July 24, 1896. This road extends from Chester to Chester Quarries, was operated, under contract, by the Boston and Albany Railroad Company, and is now operated by The New York Central and Hudson River Railroad Company under the lease of the Boston and Albany Railroad. CLAYTON AND THERESA RAILROAD COMPANY: see The Utica and Black River Railroad Company. THE CLEARFIELD SOUTHERN RAILROAD COMPANY: see Beech Creek Extension Railroad Company. CONEWANGO VALLEY RAILROAD COMPANY: see Dunkirk Allegheny Valley and Pittsburgh Railroad Company. THE CORNING AND BLOSSBURG RAILROAD COMPANY: see Geneva Corning and Southern Railroad Company. CORNING COWANESQUE AND ANTRIM RAILWAY COMPANY: see Geneva Corning and Southern Railroad Company. Incorporated under the laws of the State of New Jersey under date of July 28, 1897, and property leased to the New York and Ottawa Bridge Company November 1, 1900. The company was organized to complete the American end of a bridge across the St Lawrence River, the Canadian portion of the bridge being built by the Ottawa and New York Railway Company. These bridge sections form a connection between the New York and Ottawa Railway and the Ottawa and New York Railway. The entire capital stock of the Cornwall Bridge Company is in the treasury of The New York Central and Hudson River Railroad Company, and its entire issue of bonds, $250,000, was acquired by the New York and Ottawa Bridge Company and forms part of the collateral securing $500,000 in bonds of the latter company. COWANESQUE VALLEY RAILROAD COMPANY: see Geneva Corning and Southern Railroad Company. CURWENSVILLE AND BOWER RAILROAD COMPANY: see Beech Creek Extension Railroad Company. THE DIRECT RAILWAY BETWEEN SYRACUSE AND ROCHESTER: see The Rochester and Syracuse Railroad Company. Incorporated December 31, 1872; was formed by the consolidation of The Warren and Venango Railroad Company, incorporated October 6, 1871, and The Dunkirk Warren and Pittsburgh Railway Company. The Dunkirk Warren and Pittsburgh Railway Company had been formed on May 14, 1870, by the consolidation of the Dunkirk Warren and Pittsburgh Railroad Company, incorporated March 14, 1867, and the Conewango Valley Railroad Company, incorporated March 24, 1870. The Dunkirk Allegheny Valley and Pittsburgh Railroad was leased to The New York Central and Hudson River Railroad Company, January 3, 1873, for the term of five hundred and one years from December 1, 1872, the consideration being the payment of seven per cent interest per annum on mortgage bonds of the original companies, not exceeding $3,200,000, and one and one-half per cent dividend annually on 13,000 shares of stock. The several bonds matured in 1900, but were not retired until 1911, when a first mortgage bond, dated August 1, 1910, for $2,900,000.00, bearing interest at the rate of four and one-half per cent, was issued in their stead. It is operated by The Lake Shore and Michigan Southern Railway Company as agent for the lessee. DUNKIRK WARREN AND PITTSBURGH RAILROAD COMPANY: see Dunkirk Allegheny Valley and Pittsburgh Railroad Company. THE DUNKIRK WARREN AND PITTSBURGH RAILWAY COMPANY: see Dunkirk Allegheny Valley and Pittsburgh Railroad Company. FALL BROOK COAL COMPANY: see Geneva Corning and Southern Railroad Company. FALL BROOK RAILWAY COMPANY: see Geneva Corning and Southern Railroad Company. FULTON AND OSWEGO RAILROAD COMPANY: see Rome Watertown and Ogdensburg Railroad Company. Organized February 4, 1909, by consolidation and merger of Syracuse Geneva and Corning Railway Company, Pine Creek Railway Company and Fall Brook Railway Company. The consolidation was approved by the Public Service Commission, Second District, State of New York, on April 8, 1909, filed in the office of the Secretary of State of the State of New York on April 12, 1909, and filed in the office of the Secretary of the Commonwealth of Pennsylvania on April 10, 1909, and became effective April 1, 1909. On April 1, 1909, the railroad and property of the new company were leased, for the term of its corporate existence (999 years) to The New York Central and Hudson River Railroad Company. The conditions of the consolidation and merger provided for the issue of capital stock to the extent of $7,325,000, of which $5,000,000 is preferred stock entitled to cumulative dividend of four per cent per annum, payable quarterly, and the remaining $2,325,000 is common stock. This stock was issued as follows: the preferred stock to the holders of $5,000,000 of the capital stock of the Fall Brook Railway Company, $1,325,000 of the common stock to the holders of the capital stock of the Syracuse Geneva and Corning Railway Company and the remaining $1,000,000 to the holders of the capital stock of the Pine Creek Railway Company. To reimburse The New York Central and Hudson River Railroad Company for advances to the constituent companies for construction, additions and betterments, to refund $600,000 bonds of the Syracuse Geneva and Corning Railway Company and $3,500,000 bonds of the Pine Creek Railway Company and to provide for future developements of the property, bonds secured by a mortgage may be issued, not to exceed $10,000,000 except with the consent of holders of two-thirds of the preferred capital stock. The conditions of the lease to The New York Central and Hudson River Railroad Company provide for the payment, as rental, of the interest as it becomes due upon all bonds and obligations of the leasing company and on bonds secured by mortgage on the property of the company at any time outstanding; four per cent per annum dividend on the preferred capital stock in equal quarterly installments direct to the holders; also three and one-half per cent per annum, in quarterly payments direct to the holders, on the common capital stock issued and outstanding. It is also provided if any second preferred capital stock should be issued the lessees shall pay, as rental, an amount equal to the annual dividend on such stock. The line of this company extends from Geneva in the state of New York to Newberry Junction in the state of Pennsylvania, a distance of nearly 167 miles and has five branches aggregating nearly 65 miles. Of this mileage 79 miles is in the state of New York and 153 miles in Pennsylvania. Fall Brook Railway Company was incorporated July 1, 1892, as successor, by change of name, to the Corning Cowanesque and Antrim Railway Company. Corning Cowanesque and Antrim Railway Company had been incorporated January 2, 1873, under laws of the State of New York and on January 9, 1873, under the laws of the Commonwealth of Pennsylvania, its constituent companies having been The Blossburg and Corning Railroad Company and the Wellsboro and Lawrenceville Railroad Company. The Blossburg and Corning Railroad Company succeeded to the franchise of the Tioga Coal, Iron, Mining and Manufacturing Company, which had been incorporated under laws of the State of New York, April 9, 1828, with power to construct slack-water navigation. This corporation was amended by chapter 81, laws of 1833, authorizing the construction of a railroad. Under chapter 90, laws of 1851, the name was changed, April 5, 1851, to The Corning and Blossburg Railroad Company. It was sold at sheriff�s sale December 31, 1852 and incorporated May 19, 1854, under the name of The Blossburg and Corning Railroad Company, the road of which was wholly in the state of New York. The Wellsboro and Lawrenceville Railroad Company, the road of which was wholly in the Commonwealth of Pennsylvania, was organized under act of legislature of Pennsylvania approved April 4, 1867. The Cowanesque Valley Railroad Company, the road of which was entirely in the commonwealth of Pennsylvania, was organized by act of legislature of Pennsylvania approved April 9, 1869, and was sold, under a decree of the Court of Common Pleas of the county of Tioga, to the Corning Cowanesque and Antrim Railway Company on May 27, 1874. Under date of April 11, 1899, the property of the Fall Brook Railway Company was leased to The New York Central and Hudson River Railroad Company for nine hundred and ninety-nine years from May 1, 1899, the consideration being a cash rental of $175,000 per annum. Pine Creek Railway Company was incorporated as the Jersey Shore Pine Creek and Buffalo Railway Company, February 17, 1870, by an act of the Commonwealth of Pennsylvania, page 149 of the laws of 1870. The name was changed to the Pine Creek Railway Company by a decree of the Court of Common Pleas of Tioga county, Pennsylvania, February 6, 1884. Its property was leased to the Fall Brook Coal Company on December 18, 1882, for the term of twenty years from June 30, 1883, the date of the completion of the road. This lease was modified by a new agreement, dated May 12, 1892, covering the unexpired term of the original lease, namely, eleven years, and was cancelled under a contract of April 11, 1899, and the property leased to The New York Central and Hudson River Railroad Company from May 1, 1899, for the term of nine hundred and ninety-nine years, the consideration being a cash rental of $35,000 per annum and interest upon all outstanding bonds and obligations. Syracuse Geneva and Corning Railway Company was formed as of October 1, 1885, agreement of consolidation filed November 2, 1885, in the office of the Secretary of State of the State of New York, by the consolidation of a previously existing company of the same name, incorporated August 27, 1875, and the Penn Yan and New York Railway Company, incorporated August 24, 1877. The property of the Syracuse Geneva and Corning Railway Company had been leased to the Fall Brook Coal Company for twenty years from October 1, 1881. On May 12, 1892, a new lease to the Corning Cowanesque and Antrim Railway Company became operative and remained in force until May 1, 1899, when, under the terms of an agreement dated April 11, 1899, the lease of 1892 was cancelled, and the property leased to The New York Central and Hudson River Railroad Company from May 1, 1899, for the term of its corporate existence, the consideration being a cash rental of $46,375 per annum, and interest upon all outstanding bonds and obligations. THE GENEVA AND LYONS RAILROAD COMPANY: see The New York Central and Hudson River Railroad Company. Incorporated October 5, 1877. The road was built by The New York Central and Hudson River Railroad Company to connect Geneva on the Auburn branch with Lyons on the main line, a distance of fourteen miles. It was opened in 1878, and was leased and absorbed January 20, 1890, by surrender of capital stock, under authority of law. THE GOUVERNEUR AND OSWEGATCHIE RAILROAD COMPANY: see The New York Central and Hudson River Railroad Company. Incorporated April 12, 1892, and road opened July 18, 1893; is operated by The New York Central and Hudson River Railroad Company under an agreement dated July 8, 1892, by the terms of which the operating company guaranteed the payment of the principal of the bonds of the owning company to an amount not exceeding $300,000, and agreed to pay the interest at the rate of five per cent per annum on said bonds. Merged March 7, 1913. GRAND JUNCTION RAILROAD AND DEPOT COMPANY: see Boston and Albany Railroad Company. HERKIMER NEWPORT AND POLAND EXTENSION RAILWAY COMPANY: see The Mohawk and Malone Railway Company. HERKIMER NEWPORT AND POLAND RAILWAY COMPANY: see The Mohawk and Malone Railway Company. HERKIMER NEWPORT AND POLAND NARROW GAUGE RAILWAY COMPANY: see The Mohawk and Malone Railway Company. THE HOBOKEN AND HUDSON RIVER TURNPIKE COMPANY: see New York and Fort Lee Railroad Company. HOOVERHURST AND SOUTHWESTERN RAILROAD COMPANY: see Beech Creek Extension Railroad Company. Incorporated May 9, 1902, under an act of Assembly of Commonwealth of Pennsylvania entitled "An Act to authorize the formation and regulation of railroad corporations;" approved April 24, 1868, and the Acts supplemental thereto. Merged into and became part of the Beech Creek Extension Railroad Company on December 27, 1913. HUDSON AND BOSTON RAILROAD CORPORATION: see Boston and Albany Railroad Company. The two railroad bridges crossing the Hudson River between Rensselaer and Albany are owned nominally by a separate organization called The Hudson River Bridge Company at Albany, incorporated April 9, 1856. This ownership is vested in The New York Central and Hudson River Railroad Company, three-fourths, and the Boston and Albany Railroad Company, one-fourth. Except for foot passengers, the bridges are used exclusively for railroad purposes. The north bridge was opened in 1866, and the south bridge in 1872. THE HUDSON RIVER RAILROAD COMPANY: see The New York Central and Hudson River Railroad Company. THE HUDSON RIVER WEST SHORE RAILROAD COMPANY: see West Shore Railroad Company. THE JERSEY CITY AND ALBANY RAILROAD COMPANY: see West Shore Railroad Company. THE JERSEY CITY AND ALBANY RAILROAD COMPANY (N Y): see West Shore Railroad Company. THE JERSEY CITY AND ALBANY RAILROAD COMPANY (N J): see West Shore Railroad Company. THE JERSEY CITY AND ALBANY RAILWAY COMPANY OF THE STATES OF NEW YORK AND NEW JERSEY: see West Shore Railroad Company. Incorporated March 2, 1886; received a charter from the Legislature of the State of New Jersey dated March 2, 1886, authorizing it to build a line of railroad from Jersey City to Bayonne, a distance of about five miles. No part of the projected line has been constructed. The capital stock is owned by the New Jersey Junction Railroad Company. JERSEY SHORE PINE CREEK AND BUFFALO RAILWAY COMPANY: see Geneva Corning and Southern Railroad Company. THE JUNCTION RAILROAD COMPANY: see The New York Central and Hudson River Railroad Company. Incorporated April 20, 1870. The road was built by The New York Central and Hudson River Railroad Company to connect its main lines between East Buffalo and North Buffalo and was opened November 1, 1871. It was leased April 10, 1875, and absorbed by The New York Central and Hudson River Railroad Company October 1, 1879. LAKE ONTARIO RAILROAD COMPANY: see Rome Watertown and Ogdensburg Railroad Company. LAKE ONTARIO SHORE RAILROAD COMPANY: see Rome Watertown and Ogdensburg Railroad Company. THE LEWISTON RAILROAD COMPANY: see The New York Central Railroad Company. Incorporated May 6, 1836, and road opened in 1837; merged September 30, 1855. LITTLE FALLS AND DOLGEVILLE RAILROAD COMPANY: see The New York Central and Hudson River Railroad Company. This company was incorporated December 27, 1902, as the successor of a company of the same name, incorporated February 20, 1891, construction of whose road was completed December 31, 1893, at a cost of $575,000, to cover which $250,000 capital stock, $250,000 first mortgage bonds and $75,000 second mortgage bonds were issued. The original company went into receivership May 27, 1899, and the first mortgage was foreclosed. The property of the company was sold July 24, 1902. Reorganization was effected and $250,000 of new capital stock and $250,000 of new first mortgage bonds were issued. The holders of the original first mortgage bonds received an amount of the new issue equal to their holdings of the old bonds and capital stock equal to the amount of unpaid interest which accrued during the receivership. The balance of the capital stock was used to pay the expense of reorganization. The operation of the road under the new organization commenced on January 1, 1903. The control of the road passed to The New York Central and Hudson River Railroad Company on July 24, 1906, through its purchase of a majority of the capital stock. Consolidated April 16, 1913. LOCKPORT AND NIAGARA FALLS RAILROAD COMPANY: see Rochester Lockport and Niagara Fails Railroad Company. LOYALHANNA AND YOUGHIOGHENY RAILROAD COMPANY: see Beech Creek Extension Railroad Company. THE MAHOPIC FALLS RAILROAD COMPANY: see The New York Central and Hudson River Railroad Company. Organized under the General Railroad Law of the State of New York March 8, 1884. Constructed originally from Baldwin Place to Mahopac Mines, near Mahopac Falls, a distance of 4.05 miles. The road was operated, under an agreement, by The New York City and Northern Railroad Company. Upon the purchase of the latter named company, under foreclosure proceedings, and the formation of The New York and Putnam Railroad Company, as described in the paragraph relating to that company, the control of the Mahopac Falls Railroad was assumed by The New York Central and Hudson River Railroad Company. In 1902, that portion of the line from Mahopac Falls to Mahopac Mines was abandoned with the consent of the Railroad Commissioners of the State of New York. The capital stock of The Mahopac Falls Railroad Company, $100,000 was owned by The New York and Putnam Railroad Company; merged with The New York and Putnam Railroad Company on March 7, 1913. MALONE AND ST LAWRENCE RAILWAY COMPANY: see The St. Lawrence & Adirondack Railway Company. THE MIDLAND TERMINAL AND FERRY COMPANY: see West Shore Railroad Company. MOHAWK AND ADIRONDACK RAILROAD COMPANY: see The Mohawk and Malone Railway Company. MOHAWK AND HUDSON RAILROAD COMPANY: see The Albany and Schenectady Railroad Company. THE MOHAWK AND MALONE RAILWAY COMPANY: see The New York Central and Hudson River Railroad Company. Incorporated June 23, 1892, by the consolidation of Herkimer Newport and Poland Railway Company, Herkimer Newport and Poland Extension Railway Company and St Lawrence and Adirondack Railroad Company and its railroad and property leased for the term of its corporate existence to The New York Central and Hudson River Railroad Company May 1, 1893; the consideration being a guarantee of the principal and interest of four per cent first mortgage bonds not exceeding $2,500,000. A new lease was made April 17, 1902, the consideration being a guarantee of the principal and interest of four per cent first mortgage bonds not exceeding $2,500,000, and interest on three and one-half per cent consolidated mortgage gold bonds not exceeding $10,000,000, of which $3,900,000 were outstanding, and $2,500,000 were to be reserved to replace the first mortgage bonds above mentioned. As a further consideration the lessee agreed to pay four per cent per annum on the then outstanding capital stock. Merged with The New York Central and Hudson River Railroad Company March 7, 1913. Herkimer Newport and Poland Railway Company, incorporated July 8, 1880, as a narrow gauge railroad under the name of Herkimer Newport and Poland Narrow Gauge Railway Company. The road, extending from Herkimer to Poland, was opened in 1881. The Mohawk Valley and Northern Railway Company was incorporated October 31, 1890, to build a road from Poland to Noblesborough. On April 30, 1891, these two companies consolidated into The Mohawk Valley and Northern Railway Company. On December 8, 1891, The Mohawk Valley and Northern Railway Company was reincorporated as the Herkimer Newport and Poland Railway Company, and under authority of an Act of the Legislature dated March 16, 1891, the gauge was changed to standard in the year 1892. Herkimer Newport and Poland Extension Railway Company and St. Lawrence and Adirondack Railroad Company. Incorporated September 10, 1891. These companies were a reorganization in two divisions of the Mohawk and Adirondack Railroad Company, which was incorporated March 5, 1891, its railroad extending from Poland to Malone. The first named of the new companies covered the line from Poland to Remsen and the second from Remsen to Malone. THE MOHAWK VALLEY RAILROAD COMPANY: see The New York Central Railroad Company. Incorporated December 29, 1852. No road was constructed; the company was consolidated into The New York Central Railroad Company under the act of 1853. THE MOHAWK VALLEY AND NORTHERN RAILWAY COMPANY: see The Mohawk and Malone Railway Company. THE NATIONAL STOCK YARD COMPANY: see West Shore Railroad Company. Incorporated February 27, 1886, under the laws of the State of New Jersey. It owns a double track railroad, connecting the West Shore Railroad with the trunk lines terminating at and near Jersey City, extending from Weehawken to a junction with the Pennsylvania Railroad at Jersey City, and a branch to a junction with same road near Harsimus Cove. Its railroad and property were leased, with the consent of the Legislature of the State of New Jersey to The New York Central and Hudson River Railroad Company for one hundred years from July 1, 1886, with the privilege of a further term of one hundred years, at an annual rental of interest at four per cent on its outstanding bonds. The road was opened for through business for freight trains in May and for passenger trains in June, 1887. The New Jersey Junction Railroad Company owns the capital stock of the following companies: Jersey City and Bayonne Railroad Company, New Jersey Shore Line Railroad Company and State Line and Stony Point Railroad Company. This company was organized February 25, 1886, and received a charter dated March 2, 1886, from the Legislature of the State of New Jersey, empowering it to construct and maintain a line of railroad from a point in the township of Union, Hudson county, to a point in the town of Harrington, Bergen county, a total length of about fifteen and one-half miles. A portion of the projected railroad was constructed in the year 1910 from a point in the yard of the West Shore Railroad at Weehawken to the tracks of the Erie Railroad at Shadyside, a distance of 85/100ths of a mile, with side tracks measuring 26/l00ths of a mile, and opened for traffic March 14, 1911, the first movement of cars taking place on May 16, 1911. The balance of the projected route was formally abandoned and the money deposited with the State of New Jersey as security for the completion of the work was returned to the company. The capital stock is owned by the New Jersey Junction Railroad Company. THE NEW YORK AND BOSTON RAILROAD COMPANY: see The New York and Putnam Railroad Company. NEW YORK AND BULL'S FERRY RAILROAD COMPANY: see New York and Fort Lee Railroad Company. THE NEW YORK CENTRAL RAILROAD COMPANY: see The New York Central and Hudson River Railroad Company. THE NEW YORK CENTRAL AND HUDSON RIVER RAILROAD COMPANY (organized November 1, 1869): see The New York Central and Hudson River Railroad Company (organized April 16, 1913). Incorporated March 26, 1877, and road opened April, 1888. Operated by The New York Central and Hudson River Railroad Company by virtue of its ownership of the entire capital stock; merged March 7, 1913. NEW YORK CITY AND NORTHERN RAILROAD COMPANY: see The New York and Putnam Railroad Company. Chartered by the State of New Jersey as the New York and Bull's Ferry Railroad Company on March 14, 1861, on the purchase of The Hoboken and Hudson River Turnpike Company, incorporated March 16, 1857. The name was changed to its present title by supplemental act of the Legislature of the State of New Jersey on March 8, 1862. The road was opened for traffic in 1870. A portion of this company's right of way and tracks, amounting to about .24 of a mile, was leased to the New Jersey Junction Railroad Company on June 30, 1886. The railroad and property, other than that which was leased to the New Jersey Junction Railroad Company, has disappeared in the construction of the West Shore Railroad terminals at Weehawken. The entire capital stock of the New York and Fort Lee Railroad Company was acquired by The New York Central and Hudson River Railroad Company in 1886. Incorporated April 25, 1831; road opened May 10, 1852; corporate existence extended five hundred years from April 16, 1889. The steam portion of this company's road, running from Forty-second street, New York City, to Chatham, was leased April 1, 1873 (lease to expire April 1, 2274), to The New York Central and Hudson River Railroad Company, the annual rental being interest on its funded debt and eight per cent on its capital stock. Under the terms of a supplementary agreement, dated October 1, 1898, between The New York Central and Hudson River Railroad Company and the New York and Harlem Railroad Company, the former company now pays, as rental, interest on $12,000,000 first mortgage three and one-half per cent bonds and ten per cent dividend on $10,000,000 capital stock such dividend being the eight per cent guaranteed under the original lease and an additional two per cent (from May 1, 1900) by reason of the refunding, at a lower rate of interest, of the consolidated mortgage bonds of the New York and Harlem Railroad Company. The New York and Mahopac Railroad Company, incorporated March 7, 1871, the line of which extending from Goldens Bridge to Lake Mahopac, a distance of seven miles, was opened June 17, 1872, was leased on the same date to the New York and Harlem Railroad Company, at a nominal rental, the ownership of the capital stock having been transferred to the lessee under the terms of the lease. The capital stock was surrendered June 8, 1880, and the road became part of the New York and Harlem Railroad. THE NEW YORK AND MAHOPAC RAILROAD COMPANY: see New York and Harlem Railroad Company. THE NEW YORK AND NORTHERN RAILWAY COMPANY: see The New York and Putnam Railroad Company. Organized April 15, 1899, and chartered as a New Jersey corporation April 18, 1899. This company leased, under date of November 1, 1900, the bridge properties of the Ottawa and New York Railway Company and the Cornwall Bridge Company at an annual rental of $25,000 payable to the Ottawa and New York Railway Company and $12,500 payable to the Cornwall Bridge Company. The New York and Ottawa Bridge Company acquired the entire issue of bonds of the Cornwall Bridge Company ($250,000) and the entire issue of bridge section bonds of the Ottawa and New York Railway Company ($500,000) The New York and Ottawa Bridge Company issued its collateral bonds to the amount of $500,000, secured by the $750,000 bonds above mentioned. All of the collateral bonds of the New York and Ottawa Bridge Company and its entire issue of capital stock are in the treasury of the New York Central and Hudson River Railroad Company. An agreement dated November 1, 1900, provides that the Ottawa and New York Railway Company shall pay to the New York and Ottawa Bridge Company the sum of $30,000 per annum for running rights over the combined bridges. NEW YORK AND OTTAWA RAILROAD COMPANY: see New York and Ottawa Railway Company. NEW YORK AND OTTAWA RAILWAY COMPANY: see The New York Central and Hudson River Railroad Company. This company was organized January 19, 1905, under Stock Corporation Law of the general railroad laws of the State of New York as a successor to the New York and Ottawa Railroad Company, sold under foreclosure proceedings December 22, 1904. Its line of road was leased to The New York Central and Hudson River Railroad Company, under an annual lease, February 1, 1905; the lessee company agreeing to furnish funds to provide such equipment as may be necessary; to pay all expenses of operation and maintenance; all taxes; and the interest upon all obligations of the lessor company outstanding from time to time. Merged March 7, 1913. Its predecessor, the New York and Ottawa Railroad Company, was formed October 28, 1897, by the consolidation of the New York and Ottawa Railroad Company (chartered July 22, 1897) and the Northern New York Railroad Company (incorporated May 27, 1895, and purchased by the New York and Ottawa Railroad Company in July, 1897). The Northern New York Railroad Company had previously purchased, under foreclosure proceedings on May 25, 1895, the property of the Northern Adirondack Railroad Company which had been in the hands of a receiver from January 25, 1894. The Northern Adirondack Railroad Company was formed April 9, 1890, by the consolidation of The Northern Adirondack Railroad Company (incorporated February 9, 1883) and the Northern Adirondack Extension Railroad Company (incorporated February 17, 1886). THE NEW YORK AND PUTNAM RAILROAD COMPANY: see The New York Central and Hudson River Railroad Company. Organized in conformity with the provisions of an act of the Legislature of the State of New York, entitled "An act to amend the Stock Corporation Law," passed May 18, 1892, being chapter 688, laws of 1892, and also an act entitled "An act in relation to railroads, constituting chapter 39 of the general law's," approved June 7, 1890, being chapter 565, laws of 1890, and any acts amendatory thereof and supplemental thereto. Under judgment of foreclosure against The New York and Northern Railway Company, the property and franchises of said company were sold December 28, 1893, and on the 12th day of January, 1894, were duly conveyed to the purchasers, J. Pierpont Morgan, J. Hood Wright and Charles H. Coster, joint tenants. On the 12th day of January, 1894, said purchasers organized The New York and Putnam Railroad Company, certificate of incorporation filed in the office of the Secretary of State of the State of New York on April 13, 1894, and on the 15th day of January, 1894, conveyed all the property and franchises so acquired to The New York and Putnam Railroad Company. Under date of February 1, 1894, the railroad property of The New York and Putnam Railroad Company was leased to The New York Central and Hudson River Railroad Company for the term of the corporate existence of the lessor company, at an annual rental of interest at four per cent on first consolidated mortgage gold bonds not to exceed $5,000,000 of principal, and also upon $1,200,000 additional of said bonds to be issued to retire a like amount of the first mortgage five per cent bonds of The New York and Northern Railway Company when they mature. The company merged with itself, on March 7, 1913, The Mahopac Falls Railroad Company and on the same date was merged into The New York Central and Hudson River Railroad Company. The New York and Northern Railway Company, incorporated October 1, 1887, after the sale under foreclosure on August 17, 1887, of the railroad and property of the New York City and Northern Railroad Company. On November 11, 1887, it merged with itself the Yonkers Rapid Transit Railway Company Yonkers Division, incorporated June 8, 1880, and the Yonkers Rapid Transit Railway Company New York Division, incorporated November 23, 1881, which latter company was a reincorporation, by change of name, of The Yonkers Rapid Transit Railway Company (Kingsbridge to city of Yonkers), incorporated March 18, 1879, and opened in December, 1880. New York City and Northern Railroad Company, incorporated March 1, 1878, acquired, under lease dated March 21, 1878, the property of the New York Westchester and Putnam Railway Company, which was incorporated July 3, 1877, as the successor, by reorganization, of a part of the property of The New York and Boston Railroad Company, incorporated May 21, 1869, sold June 5, 1876. Under date of May 1, 1880, the New York City and Northern Railroad Company also acquired, under lease, the property of the West Side and Yonkers Railway Company, which was incorporated August 25, 1879, and subsequently merged with the New York City and Northern Railroad Company on July 16, 1887. NEW YORK WESTCHESTER AND PUTNAM RAILWAY COMPANY: see The New York and Putnam Railroad Company. NEW YORK WEST SHORE AND BUFFALO RAILWAY COMPANY: see West Shore Railroad Company. THE NEW YORK WEST SHORE AND CHICAGO RAILROAD COMPANY: see West Shore Railroad Company. NIAGARA BRIDGE AND CANANDAIGUA RAILROAD COMPANY: see The New York Central and Hudson River Railroad Company. Originally The Canandaigua and Niagara Falls Railroad Company, which filed articles March 1, 1851, was incorporated May 18, 1851, opened April 1, 1854, and sold March 22, 1857. The Niagara Bridge and Canandaigua Railroad Company was incorporated August 25, 1858, and leased to The New York Central Railroad Company September 1, 1858, at six per cent per annum on $1,000,000 capitol stock. The entire capital stock was subsequently purchased by The New York Central and Hudson River Railroad Company and the road merged January 10, 1890. THE NIAGARA FALLS BRANCH RAILROAD COMPANY: see The New York Central and Hudson River Railroad Company. Incorporated December 24, 1875; originally named The Niagara Falls and Lake Ontario Railroad Company. incorporated September 9, 1852, and sold November 16, 1880. The road of The Niagara Falls Branch Railroad Company was leased to the Rome Watertown and Ogdensburg Railroad Company September 21, 1881, at an annual rental of seven per cent on its capital stock of $250,000. The lease was assumed by The New York Central and Hudson River Railroad Company on March 14, 1891. Consolidated April 16, 1913. THE NIAGARA FALLS AND LAKE ONTARIO RAILROAD COMPANY: see The Niagara Falls Branch Railroad Company. Incorporated June 24, 1875; road opened January 1, 1876, and leased to the Boston and Albany Railroad Company for fifty years from January 1, 1886, at an annual rental of $3,000, being three per cent on the capital stock of $100,000. The lease was assumed by The New York Central and Hudson River Railroad Company. NORTHERN ADIRONDACK RAILROAD COMPANY: see New York and Ottawa Railway Company. THE NORTHERN ADIRONDACK RAILROAD COMPANY: see New York and Ottawa Railway Company. NORTHERN ADIRONDACK EXTENSION RAILROAD COMPANY: see New York and Ottawa Railway Company. NORTHERN NEW YORK RAILROAD COMPANY: see New York and Ottawa Railway Company. NORWOOD AND MONTREAL RAILROAD COMPANY: see Rome Watertown and Ogdensburg Railroad Company. NORTH RIVER RAILROAD COMPANY: see West Shore Railroad Company. NORTH RIVER RAILWAY COMPANY: see West Shore Railroad Company. THE OGDENSBURGH AND MORRISTOWN RAILROAD COMPANY: see The Utica and Black River Railroad Company. ONTARIO PACIFIC RAILWAY COMPANY: see Ottawa and New York Railway Company. THE OPEN CUT AND GENERAL STOREHOUSE COMPANY: see West Shore Railroad Company. OSWEGO RAILROAD BRIDGE COMPANY: see Rome Watertown and Ogdensburg Railroad Company. OSWEGO AND ROME RAILROAD COMPANY: see The New York Central and Hudson River Railroad Company. Incorporated April 11, 1863, road opened January 1, 1866, and leased September 7, 1863, to the Rome Watertown and Ogdensburgh Railroad Company. The annual rental, under modified lease of May 2, 1891, was seven per cent on $350,000 first mortgage bonds and five per cent on second mortgage bonds not exceeding $400,000. The lease was assumed by The New York Central and Hudson River Railroad Company on March 14, 1891. Consolidated April 16, 1913. Chartered in 1882, as the Ontario Pacific Railway Company and the present name assumed by act of the Canadian Parliament in 1897. Its capital stock was owned, and its line of railroad operated by the New York and Ottawa Railroad Company, until the sale of the road of the latter company under foreclosure proceedings, December 22, 1904. The entire capital stock of this company is now in the treasury of The New York Central and Hudson River Railroad Company. PENN YAN AND NEW YORK RAILWAY COMPANY: see Geneva Corning and Southern Railroad Company. PHILADELPHIA AND PITTSBURGH RAILROAD COMPANY: see Beech Creek Extension Railroad Company. PINE CREEK RAILWAY COMPANY: see Geneva Corning and Southern Railroad Company. PITTSBURGH AND EASTERN RAILROAD COMPANY: see Beech Creek Extension Railroad Company. Incorporated March 18, 1845, and road, extending from Pittsfield to North Adams, opened December 1, 1846; leased December 1, 1876, for ninety-nine years, to the Boston and Albany Railroad Company at five per cent upon its cost, which is represented by a capital stock of $450,000. The lease was assumed by The New York Central and Hudson River Railroad Company. POTSDAM AND WATERTOWN RAILROAD COMPANY: see Rome Watertown and Ogdensburg Railroad Company. Incorporated March 23, 1882; road extends from Webster to Auburn. Was operated, under contract, by the Boston and Albany Railroad Company and is now operated by The New York Central and Hudson River Railroad Company under the lease of the Boston and Albany Railroad. THE RIDGEFIELD PARK RAILROAD COMPANY: see West Shore Railroad Company. ROCHESTER AND LAKE BEACH RAILROAD COMPANY: see Rome Watertown and Ogdensburg Railroad Company. ROCHESTER AND LAKE ONTARIO RAILROAD COMPANY: see The New York Central Railroad Company. Incorporated May 17, 1852, road leased August 25, 1852, and opened in 1853; merged September 30, 1855. THE ROCHESTER LOCKPORT AND NIAGARA FALLS RAILROAD COMPANY: see The New York Central Railroad Company. Incorporated December 14, 1850. This company rebuilt and opened in July, 1852, the road originally incorporated April 24, 1834, as the Lockport and Niagara Falls Railroad Company. The original line was opened in 1838 and sold June 2, 1850. Consolidated into The New York Central Railroad Company under the act of 1853. ROCHESTER AND ONTARIO BELT RAILWAY COMPANY: see Rome Watertown and Ogdensburg Railroad Company. THE ROCHESTER AND SYRACUSE RAILROAD COMPANY: see The New York Central Railroad Company. Consolidation, under date of August 1, 1850, of The Auburn and Rochester Railroad Company, which was incorporated May 13, 1836, and road opened in August, 1841; and The Auburn and Syracuse Railroad Company, which was incorporated May 1, 1834, and road opened in June, 1838. The Direct Railway between Syracuse and Rochester, incorporated June 18, 1848, was merged with The Rochester and Syracuse Railroad Company under date of August 6, 1850. Consolidated into The New York Central Railroad Company under the act of 1853. ROCKLAND CENTRAL RAILROAD COMPANY: see West Shore Railroad Company. THE ROCKLAND CENTRAL RAILROAD COMPANY: see West Shore Railroad Company. ROCKLAND CENTRAL EXTENSION RAILROAD COMPANY: see West Shore Railroad Company. ROME WATERTOWN AND OGDENSBURG RAILROAD COMPANY: see The New York Central and Hudson River Railroad Company. ROME WATERTOWN AND OGDENSBURG RAILROAD COMPANY: see Rome Watertown and Ogdensburg Railroad Company. ROME WATERTOWN AND OGDENSBURG TERMINAL RAILROAD COMPANY: see Rome Watertown and Ogdensburg Railroad Company. ST LAWRENCE AND ADIRONDACK RAILROAD COMPANY: see The Mohawk and Malone Railway Company. THE ST LAWRENCE AND ADIRONDACK RAILWAY COMPANY: see The St Lawrence & Adirondack Railway Company. Incorporated July 2, 1896, under the general railroad law of the State of New York and by acts of Parliament of the Dominion of Canada, 57-58 Victoria, chapter 93, and 59 Victoria, chapter 37, and is a consolidation of The St Lawrence and Adirondack Railway Company, which was formed November 18, 1895, by consolidation of the Malone and St Lawrence Railway Company, incorporated September 10, 1891, under the laws of the State of New York, with line extending from Malone, New York, to the international boundary, opened January 11, 1892, and the St Lawrence and Adirondack Railway Company which was incorporated May 4, 1888, under the laws of the Dominion of Canada, with line extending from the international boundary to Valleyfield in the Province of Quebec, opened January 11, 1892, and the Southwestern Railway Company, incorporated May 22, 1888, by act of the Canadian Parliament, 51 Victoria, chapter 52, with line extending from Beauharnois to Caughnawaga Junction, both in the Province of Quebec, opened in 1897. The line owned by the company extends from Malone Junction, New York, to Valleyfield in the Province of Quebec, 30.17 miles and from Beauharnois to Adirondack Junction, both in the Province of Quebec, 12.9 miles. To connect these two portions, a part of the line of the Grand Trunk Railway Company, known as the Beauharnois Junction Railroad, extending from Valleyfield to Beauharnois, a distance of 13.3 miles, was leased January 1, 1896, for a period of ninety-nine years at an annual cash rental of $10,000, and to secure access to the city of Montreal, trackage rights were acquired from the Canadian Pacific Railway Company over its line between Adirondack Junction and Montreal, a distance of 8.8 miles, with terminal facilities in the latter named city. The New York Central and Hudson River Railroad Company became agents of The St Lawrence & Adirondack Railway Company under an agreement dated June 1, 1898, terminable upon sixty days notice in writing by either party, by which it conducts the operations of the entire line from Malone Junction to Montreal, without participating in the profits or sharing the losses of such operation. On January 1, 1905, The New York Central and Hudson River Railroad Company acquired by purchase the entire outstanding mg capital stock of The St Lawrence & Adirondack Railway Company, but continues to operate the line under the terms of the above mentioned contract. THE SARATOGA AND HUDSON RIVER RAILROAD COMPANY: see The New York Central Railroad Company. Incorporated April 16, 1864. Length of line authorized was 58 miles, and 26 miles of track had been laid in 1865. On March 7, 1867, this road was leased, for the term of its charter and any renewal or extension thereof, to The New York Central Railroad Company, and the company was merged with The New York Central Railroad Company on September 9, 1867. At that time the track extended from a point on the Hudson River in the town of Athens, county of Greene, to a point in the town of Rotterdam, county of Schenectady. Under date of November 2, 1881, the road formerly constituting The Saratoga and Hudson River Railroad, extending from Athens to Schenectady, was leased to the New York West Shore and Buffalo Railway Company for four hundred and seventy-five years from November 1, 1881, and for and during the corporate existence of The New York Central and Hudson River Railroad Company beyond that period, at an annual rental of $20,000 and taxes. Under a subsequent agreement the annual rental was commuted for the gross sum of $400,000. THE SCHENECTADY AND TROY RAILROAD COMPANY: see The New York Central Railroad Company. Incorporated May 21, 1836, and road opened in 1842; consolidated into The New York Central Railroad Company under the act of 1853. SOUTHWESTERN RAILWAY COMPANY: see The St Lawrence & Adirondack Railway Company. SPRINGFIELD ATHOL AND NORTH-EASTERN RAILROAD COMPANY: see Boston and Albany Railroad Company. THE SPRINGFIELD AND NORTH-EASTERN RAILROAD COMPANY: see Boston and Albany Railroad Company. THE SPUYTEN DUYVIL AND PORT MORRIS RAILROAD COMPANY: see The New York Central and Hudson River Railroad Company. Incorporated March 4, 1869. The railroad of this company connecting the New York and Harlem Railroad with the New York Central and Hudson River Railroad was opened April 7, 1872; leased November 1, 1871, until December 31, 1970, at an annual cash rental of $79,120. On May 19, 1909, a new lease, for the corporate existence of the lessor company, was executed, the rental being an annual dividend of eight per cent, payable in quarterly installments direct to the holders of its capital stock. The lessor company agreed to mortgage its property to secure the payment of bonds, to be issued, as necessity arose, for the funding of the indebtedness of The Spuyten Duyvil and Port Morris Railroad Company for construction, additions and betterments to its property and for future expenditures of the same nature. Merged March 7, 1913. The articles of association of this company were filed on March 6, 1886, to build a line about l8 � miles long, located in Rockland county, New York. No part of the projected line has been constructed. The capital stock is owned by the New Jersey Junction Railroad Company. SUSQUEHANNA AND CLEARFIELD RAILROAD COMPANY: see Beech Creek Extension Railroad Company. THE SUSQUEHANNA AND SOUTH WESTERN RAILROAD COMPANY: see Beech Creek Railroad Company. THE SYRACUSE CHENANGO AND NEW YORK RAILROAD COMPANY: see West Shore Railroad Company. SYRACUSE AND CHENANGO RAILROAD COMPANY: see West Shore Railroad Company. THE SYRACUSE AND CHENANGO VALLEY RAILROAD COMPANY: see West Shore Railroad Company. THE SYRACUSE JUNCTION RAILROAD COMPANY: see The New York Central and Hudson River Railroad Company. THE SYRACUSE AND NORTHERN RAILROAD COMPANY: see Rome Watertown and Ogdensburg Railroad Company. SYRACUSE NORTHERN RAILROAD COMPANY: see Rome Watertown and Ogdensburg Railroad Company. SYRACUSE NORTHWESTERN RAILROAD COMPANY: see Rome Watertown and Ogdensburg Railroad Company. THE SYRACUSE ONTARIO AND NEW YORK RAILWAY COMPANY: see West Shore Railroad Company. SYRACUSE PHOENIX AND OSWEGO RAILROAD COMPANY: see Rome Watertown and Ogdensburg Railroad Company. THE SYRACUSE PHOENIX AND OSWEGO RAILROAD COMPANY: see Rome Watertown and Ogdensburg Railroad Company. SYRACUSE PHOENIX AND OSWEGO RAILWAY COMPANY: see Rome Watertown and Ogdensburg Railroad Company. THE SYRACUSE PHOENIX AND OSWEGO RAILWAY COMPANY: see Rome Watertown and Ogdensburg Railroad Company. THE SYRACUSE AND UTICA RAILROAD COMPANY: see The New York Central Railroad Company. Incorporated May 11, 1836, and road opened July 3, 1839; consolidated into The New York Central Railroad Company under the Act of 1853. SYRACUSE AND UTICA DIRECT RAILROAD COMPANY: see The New York Central Railroad Company. Incorporated January 26, 1853; no road was constructed. The company was consolidated into The New York Central Railroad Company under the Act of 1853. Incorporated June 12, 1895, under the general railroad law of the State of New York. This road was constructed for the purpose of expediting the transfer of freight between the eastern and western roads and to avoid hauling heavy freight trains through crowded yards and through the city of Buffalo. It was opened for traffic September 15, 1898, and is operated by The New York Central and Hudson River Railroad Company under the terms of an agreement dated January 1, 1899, the owning company paying all expenses of maintaining and guarding the property. TIOGA COAL, IRON, MINING AND MANUFACTURING COMPANY: see Geneva Corning and Southern Railroad Company. TIVOLI HOLLOW RAILROAD COMPANY: see The New York Central and Hudson River Railroad Company. Incorporated May 15, 1893, and road opened same year. Operated by The New York Central and Hudson River Railroad Company under contract dated April 3, 1894. Merged March 7, 1913. TONAWANDA ISLAND BRIDGE COMPANY: see New York Central and Hudson River Railroad Company. Incorporated April 21, 1883. by an act of the Legislature of the State of New York, being chapter 279, laws of 1883. This company was organized for the purpose of constructing a bridge from a point in North Tonawanda to Tonawanda Island. Under an agreement dated April 27, 1886, The New York Central and Hudson River Railroad Company acquired the entire capital stock of the bridge company and subsequently constructed the bridge, which was operated as a siding. Merged March 7, 1913. TONAWANDA RAILROAD COMPANY: see Buffalo and Rochester Railroad Company. Incorporated May 14, 1845; road opened June, 1846. Leased June 1, 1851, for the term of its charter or any extension thereof to The Hudson River Railroad Company at an annual rental of seven per cent on $275,000 capital stock. The lease was assumed by The New York Central and Hudson River Railroad Company under the consolidation. THE UTICA AND BLACK RIVER RAILROAD COMPANY: see The New York Central and Hudson River Railroad Company. THE UTICA AND SCHENECTADY RAILROAD COMPANY: see The New York Central Railroad Company. Incorporated April 29, 1833, and road opened August 1, 1836, and consolidated into The New York Central Railroad Company under the Act of 1853. This company is the successor of The Wallkill Valley Railway Company, organized April 26, 1866, and road opened in the same year. The road was sold on June 26, 1877, and on July 2, 1877, the company was reorganized, under foreclosure proceedings, as The Wallkill Valley Railroad Company, under chapter 430, laws of 1874, of the State of New York, as amended by chapter 446, laws of 1876. Under date of April 11, 1899, the railroad and other property of the company were leased to The New York Central and Hudson River Railroad Company, from May 1, 1899, for the term of its corporate existence, the consideration being, in substance, the interest on all outstanding bonds and obligations, including interest at three and one-half per cent per annum on the first and second mortgage bonds together with a dividend of three and one-half per cent per annum on the outstanding capital stock of the company. In 1913 all its bonds were cancelled. THE WALLKILL VALLEY RAILWAY COMPANY: see the Wallkill Valley Railroad Company. THE WARREN AND VENANGO RAILROAD COMPANY: see Dunkirk Allegheny Valley and Pittsburgh Railroad Company. WATERTOWN AND ROME RAILROAD COMPANY: see Rome Watertown and Ogdensburg Railroad Company. THE WEEHAWKEN FERRY COMPANY: see West Shore Railroad Company. THE WEEHAWKEN TRANSPORTATION COMPANY: see West Shore Railroad Company. WELLSBORO AND LAWRENCEVILLE RAILROAD COMPANY: see Geneva Corning and Southern Railroad Company. WEST BRANCH VALLEY RAILROAD COMPANY: see Beech Creek Extension Railroad Company. WESTERN RAILROAD CORPORATION: see Boston and Albany Railroad Company. Organized in conformity with the provisions of an act of the Legislature of the State of New York, entitled "An Act to facilitate the reorganization of railroads sold under mortgage, and providing for the formation of new companies in such cases," passed May 11, 1874, being chapter 430, laws of 1874, and any acts amendatory thereof or supplemental thereto. Under judgment of foreclosure against the New York West Shore and Buffalo Railway Company (incorporated by consolidation June 14, 1881), the property and franchises of said company were sold at public sale on the 24th day of November, 1885, and on the 5th day of December, 1885, were duly conveyed to the purchasers, J. Pierpont Morgan, Chauncey M. Depew and Ashbel Green, joint tenants. On the 5th day of December, 1885, said purchasers organized the West Shore Railroad Company and on the same day conveyed certain portions of the property and franchises so acquired to the West Shore Railroad Company. Under date of December 5, 1885, the railroad property of the West Shore Railroad Company was leased to The New York Central and Hudson River Railroad Company for four hundred and seventy-five years from January 1, 1886, with the privilege of a further term of five hundred years, at an annual rental of the full amount of interest at four per cent on outstanding beads secured by a first mortgage not exceeding $50,000,000 of principal. This lease was ratified by the Legislature of the State of New Jersey. >From the first day of July, 1890, the Syracuse Ontario and New York Railroad was operated as the Chenango branch of the West Shore Railroad, and on the second day of April, 1891, the railroad and property of The Syracuse Ontario and New York Railway Company were formally leased, for the term of its corporate existence, to the West Shore Railroad Company. On June 30, 1891, the entire capital stock of The Syracuse Ontario and New York Railway Company was surrendered to the West Shore Railroad Company and the former company was formally absorbed by the latter under authority of law. WEST SHORE HUDSON RIVER RAILROAD COMPANY: see West Shore Railroad Company. WEST SHORE AND ONTARIO TERMINAL COMPANY: see West Shore Railroad Company. WEST SIDE AND YONKERS RAILWAY COMPANY: see The New York and Putnam Railroad Company. WINDSOR BEACH AND ONTARIO RAILROAD COMPANY: see Rome Watertown and Ogdensburg Railroad Company. YONKERS RAPID TRANSIT RAILWAY COMPANY NEW YORK DIVISION: see The New York and Putnam Railroad Company. YONKERS RAPID TRANSIT RAILWAY COMPANY YONKERS DIVISION: see The New York and Putnam Railroad Company. THE YONKERS RAPID TRANSIT RAILWAY COMPANY: see The New York and Putnam Railroad Company.